As many as 582 million people experience food-borne diseases every year. 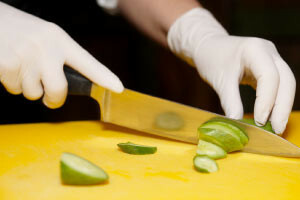 Food safety is extremely important to food-related businesses of any size. When working with food, quality must be ensured to prevent foodborne illness, contamination, allergic reactions, the spread of disease, and so much more. This free online food safety course will teach you proper food handling practices that will protect your food-service operation. This course will first introduce you to the principles behind good personal hygiene and its management. You will study the importance of water quality and learn about the regulations and customer requirements related to water quality, ice, and steam. The course will also cover the subject of pest control and product contamination control where you will learn corrective actions that need to be taken to minimize the risk of pest infestation. You will then study the correct sanitization and personal cleanliness guidelines that should be followed by employees as well as how to put together a cleaning schedule. You will study food purchasing, receiving, storage, preparation, and sanitation and learn the causes and prevention of unsafe food, foodborne illnesses, and food service accidents. You will then study the role of management in the food-service industry and the "lead by example" concept. Finally, you will learn the importance of proper staff training as well as inspections for the consistency of sanitation standards. Maintaining a top quality food business while ensuring unsurpassed hygiene is a big responsibility. By learning the best practices and procedures taught in this free online Diploma in Food Safety course, you will help ensure that you meet this responsibility. The course is specifically designed for aspiring food safety managers working in food processing plants, restaurants, and any food service operation, and aims to make learning about this important subject as clear as possible. Check out the course today, and bring your professional skills to the next level. Understand the role and influence the manager has on the rest of the food safety operation team. I really learned alot from this course. I would recommend this to others. This course has been very helpful to me and I challenge others to go for it.